The electrochemical reduction of nitrogen to ammonia is a promising way to produce ammonia at mild condition. The design and preparation of an efficient catalyst with high ammonia selectivity is critical for the real applications. 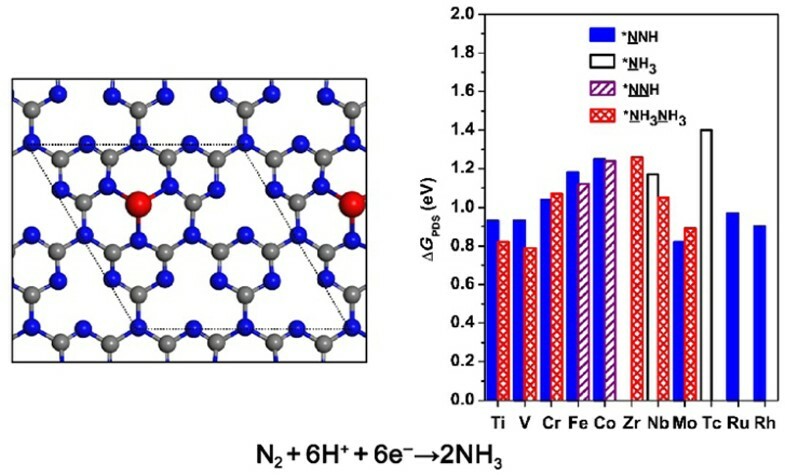 In this work, a series of transition metal (TM = Sc, Ti, V, Cr, Mn, Fe, Co, Ni, Cu, Zn, Y, Zr, Nb, Mo, Tc, Ru, Rh, Pd, Ag, and Cd) atoms supported by gt-C3N4 (TM/gt-C3N4) are investigated as electrocatalysts for the nitrogen reduction reaction (NRR) based on density functional calculations. It is found that Mo/gt-C3N4 with a limiting potential of -0.82 V is the best catalyst for standing-on adsorbed N2 cases. While for lying-on adsorbed N2 cases, V/gt-C3N4 with a limiting potential of -0.79 V is better than other materials. 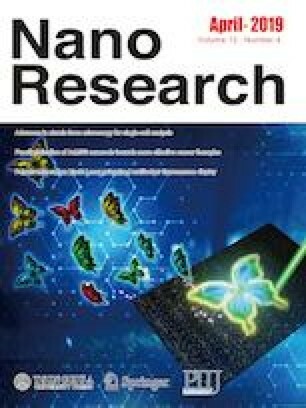 It is believed that this work provides several promising candidates for the non-noble metal electrocatalysts for NRR at mild condition. Supplementary material is available for this article at https://doi.org/10.1007/s12274-019-2378-8 and is accessible for authorized users. This work was supported by the National Natural Science Foundation of China (Nos. 21773124 and 21473167), the Fundamental Research Funds for the Central Universities (No. WK3430000005), the Fok Ying Tung Education Foundation (No. 151008), and partially by the support of China Scholarship Council (CSC) (File No. 201706345015). The calculations were performed on the super-computing system in USTC-SCC, Tianjin-SCC and Guangzhou-SCC. Computational Chemistry Comparison and Benchmark Database. https://doi.org/cccbdb.nist.gov/.